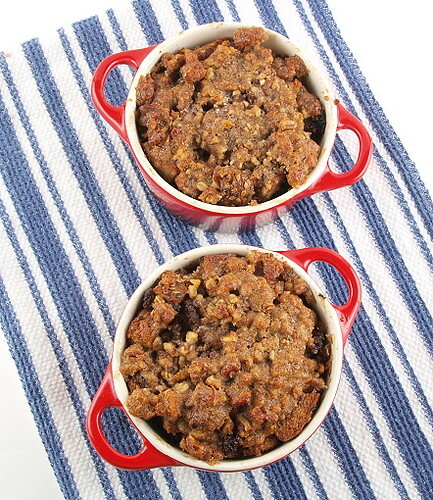 What happens when you combine breakfast and dessert? Answer: Magic! I had actually been contemplating the breakfast/dessert idea for a while. 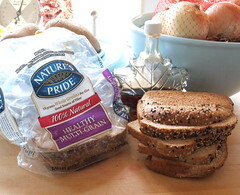 What spurred me into action was the email from the folks at FoodBuzz to let us know that Nature’s Pride would be holding their Bread Ambassador program again. Nature’s Pride will select a few lucky bloggers to get a free trip to the FoodBuzz Festival this year and to present their recipes in the Tasting Pavilion. So, I sent off for my free coupon (which I have not gotten as of this posting, so nothing in this post was provided for free) and set to work. 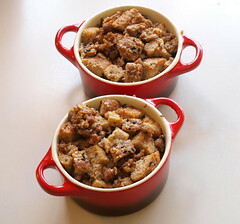 What I decided to make is a combination of bread pudding and french toast, with some spicy breakfast sausage thrown in for good measure. I did not want it too sweet, it is supposed to be a breakfast dish after all, so I used maple syrup rather than sugar in the pudding itself. 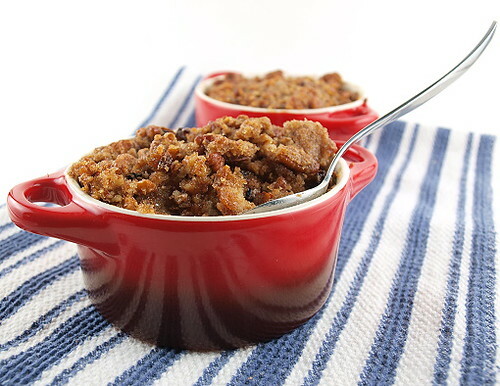 For some nutty flavor I opted for a hearty multi-grain bread, but to cut any of those health benefits I top it all off with a buttery brown sugar pecan crumble which plays well with the nuggets of savory sausage throughout the dish. 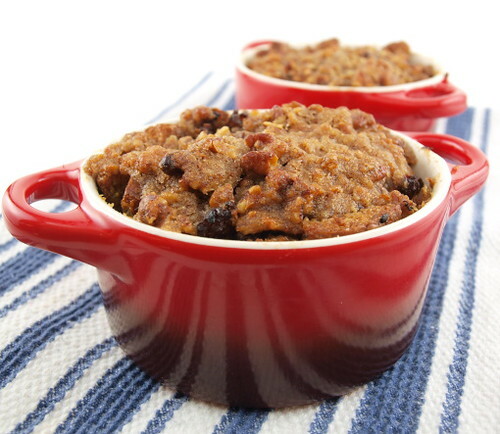 What I love best about this recipe is you can make it in a large dish for causal, family-style affairs, or you can scoop it into muffin cups and make individual servings for more formal occasions. You can serve this with syrup if you like, but it does not need it. 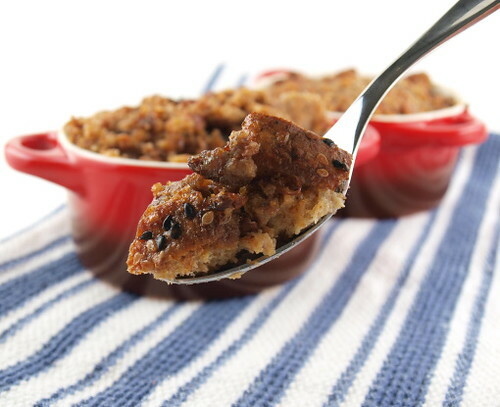 Warm from the oven I can’t think of anything more welcoming to serve guests, or your family! Heat the oven to 350 F and spray a baking dish, or muffin pan, with non-stick cooking spray. Cube the bread into 1/2 inch pieces. 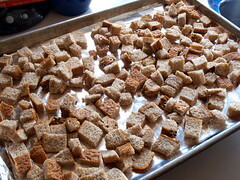 Spread evenly on a sheet pan and bake for 10 to 20 minutes, or until very dry and toasted. Allow to cool on the pan. Next, prepare the topping. 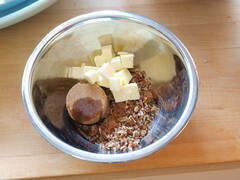 In a small bowl combine the all the ingredients until well mixed. Chill for at least ten minutes, or until firm. 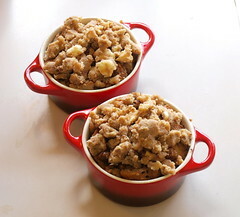 In a medium skillet over medium-high heat crumble the breakfast sausage. Cook, stirring often, until well browned and cooked through. 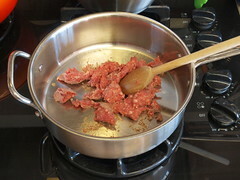 Drain off any excess fat then allow to cool slightly in the pan. 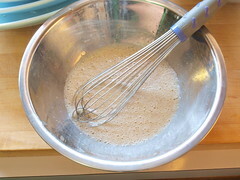 In a large bowl whisk together the melted butter, spices, maple syrup, salt, eggs, vanilla, and milk. 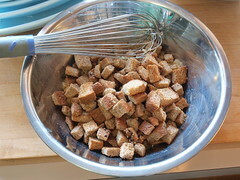 Add the toasted bread and toss to coat. Let stand for ten minutes. 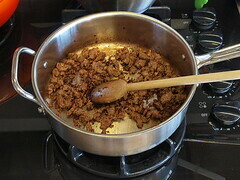 Add the cooked sausage and fold to combine. 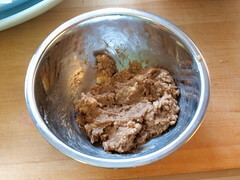 Pour the mixture into the prepared pans. Top with the chilled pecan topping. Bake for 45 to 50 minutes for a large dish, 25 to 30 minutes for muffin sized servings, or until golden brown and puffed all over. Cool for five minutes before serving.